I kept asking my mother what she wanted for dinner on Mother's Day and she kept insisting she didn't care. "Whatever's easy" she said. Well in our house nothing is easy. We can spend 3 hours making a lunch that takes 5 minutes to eat. As I try to explain to everyone...it's what we like to do. So something "easy" on Mother's Day wasn't even an option. I think mom was a bit nervous when I first mentioned making rabbit; but she ate two helpings yesterday and took home the leftovers. So I'm assuming it was good! The recipe was from Lidia's Italian Table by Lidia Bastianich. A gauzzetto is a slow simmering of meats with stock, tomatoes and lots of seasonings. It makes a velvety sauce that coats pasta really well. 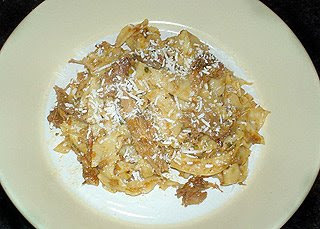 The meat in a gauzzetto can be substituted for other meats or birds of your choice. I really like this with the rabbit. Soak the porcini in 1 cup of broth until softened about 30 minutes. Drain the mushrooms, reserving the liquid. Rinse and chop the mushrooms, discarding any tough bits. Strain the liquid through a coffee filter. Set the strained liquid and chopped mushrooms aside. Tie the bay leaves, cloves and rosemary together securely in a small square of cheesecloth. In a large casserole, heat the oil over medium high heat. Add the rabbit pieces in a single layer, sprinkle lightly with salt, and cook, turning as necessary, until browned on all sides, about 8 minutes. Remove the rabbit to a plate. Pour off all but 2 tablespoons of the fat from the pot. Add the onion and sprinkle it with salt and pepper. Cook stirring often, until golden, about 5 minutes. Add the carrot and celery and cook, stirring occasionally, until wilted about 5 minutes. Add the wine and cook stirring until almost completely evaporated, about 5 minutes. Reduce the level of heat to medium, add the tomato paste, and stir until vegetables are coated. Stir in the tomatoes, the chopped porcini with their liquid, and about 1/2 cup of the remaining broth. Bring to a boil. Return the rabbit pieces to the pot and tuck the cheesecloth into the liquid. Adjust the level of the heat to a simmer, cover the casserole partially, and simmer gently until the liquid is reduced by about half, about 20 minutes. Add another 1/2 cup broth and continue simmering, adding broth and waiting until the liquid is reduced by 1/2 before adding more until rabbit is tender about 1 hour 15 minutes. Remove and discard cheesecloth. Remove the rabbit from the sauce and skim the fat from the surface. Pull the meat from the bones and coarsely shred. Return meat to pot. Add parsley and reheat to a simmer. Add cheese right before mixing with pasta. In a 10 to 12 inch saute pan, heat 2 cups of the olive oil over medium high heat until it reaches 370F. Add the eggplant slices 3 or 4 at a time and fry, turning once, until soft and light golden brown, about 2 minutes. Transfer to paper towels to drain. In a medium bowl, combine the ricotta, egg, and nutmeg and mix well. Season with salt and pepper. 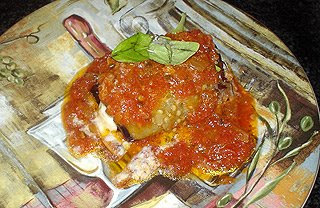 Lay the eggplant slices out on a work surface and place 1 Tbs of ricotta filling at the base of each slice. Roll the eggplant up around the filling to form a neat roll set seam side down on the work surface. Lightly oil a baking dish just large enough to hold the eggplant rolls. Pour the sauce into the dish and place the rolls seam side down in the sauce. Bake until the cheese starts to melt out of the rolls, 15 minutes. Drizzle with the remaining 1/4 cup of oil and sprinkle with fresh basil and grated Parmesan. 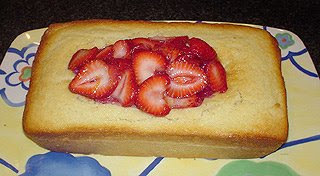 The ricotta pound cake recipe was one I'd made before. The recipe is from Gina DePalma's Dolce Italiano. Although the cake is perfect on it's own; I decided to add some orange strawberry compote and some fresh whipped cream as toppings. Whipped cream is so easy to make and tastes so much better than the stuff you get in the can. It's worth the few minutes extra it takes to make. Preheat oven to 350 and position rack in the center. Grease a 9 inch loaf pan with nonstick cooking spray and dust with flour. In a medium bowl, sift together the cake flour, baking powder and salt and set aside. In a mixer, cream together the butter, ricotta and sugar on medium speed until smooth and light about 2 minutes. Beat in the eggs, one at a time, scraping sown the bowl after each. Add the vanilla bean and extract. On low speed, beat in the dry ingredients to combine, scraping down the bowl. Beat the batter for 30 more seconds. Pour the batter into the prepared pan and use a spatula to smooth the top. Give the pan a few gentle whacks to remove any air pockets. Bake the cake for 15 minutes, then turn the pan 180 degrees. Lower the temperature to 325 and continue baking until the cake springs back lightly when touched about 25 minutes more. What a beautiful menu for Mother's Day!! Where do you get your rabbit? AJ's sells them frozen. So does Hobe meats. Great recipes. Great. Love Lidia- watching her cook is like watching my Gramma cook... delicate well practiced ballet in the kitchen- no wasted movement. The Involtini (we always called them Rollatini)... after a few years behind the line, that was still one of my favorite dishes to make (actually challenged myself and put out two trays in a record 2 hours, start to finish, when my baby sister was visiting and getting ready to go to the airport). Mom LOVED this too; it wasn't something we ate growing up; when I picked it up from the restaurant, I was the first to really make it. Now it is a staple. I always make sure we get some Eggplant in the ground to keep me well supplied over the summer. Sounds like Mother's day was great... I'm sure everyone loved it. We always called it rollatini too. Must be an east coast thing. Let's hear it for the East Coast!! Love the eggplant and the ricotta pound cake. I have made that same poundcake many times and always get so many compliments on it, it's so moist!